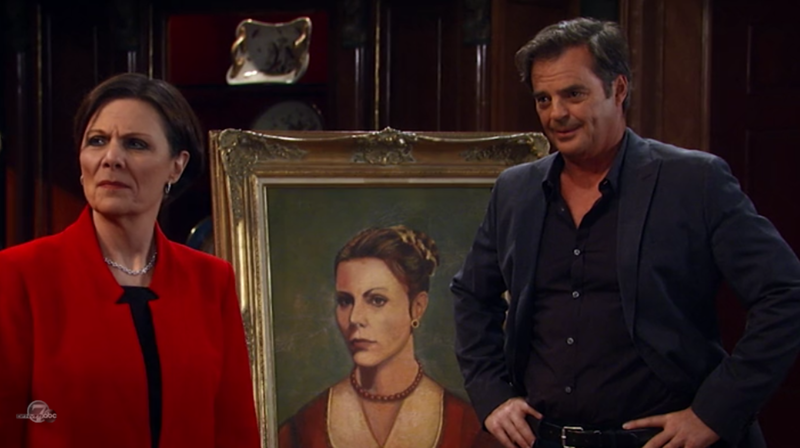 Tracy agrees to give up the painting to help Samira. Ned has the results of the DNA test. It turns out that Samira is not Edward&apos;s daughter. Nina wants Nelle to follow Valentin and report back, but Nelle doesn&apos;t want to do it. Nina threatens to fire her. Nelle feels Valentin will be honest if Nina confronts him. Nina cries that it&apos;s not the first time she&apos;s been cheated on and promises Nelle won&apos;t get caught. Nathan runs into Anna, who doesn&apos;t recognize him. She claims the meds she&apos;s on confuse her sometimes. The two make small talk before he heads off. Liz and Franco discuss the new numbers on the timeline. Franco points out that Helena died before Jake&apos;s birthday last year, so whatever she had planned would have already happened. Jason and Sam look through the book for clues. Sam points out that Jake acted out last year for attention and that may be what&apos;s happening again. Jason&apos;s still concerned about his two unaccounted years. Ned gives Samira a check for ten thousand dollars and sends her on her way. He drags Larry in. He explains that this whole thing was a scam Larry cooked up with Samira&apos;s help. Tracy wonders how Ned figured it out. Ned mentions the Thanksgiving hymn and how Edward would have never told someone about it. Everyone yells at Larry until he runs off. Nathan stops by to see Nina, who admits that she thinks Valentin and Anna have a thing going on. She doesn&apos;t understand Anna&apos;s sudden change of behavior towards Valentin. Nathan reassures her. Valentin finds Anna on the pier with a sprained ankle, but she&apos;s clearly faking. Anna takes Valentin&apos;s hand and claims she still has regrets. Nelle eavesdrops. Valentin says he&apos;s moved on and there&apos;s no need to relive the past. He spots a necklace that Anna has. It&apos;s a chimera, a creature with the head of a lion, the body of a goat and a serpent&apos;s tail. Nelle heads back to Nina and lies, telling her that Valentin went back to Wyndemere by himself. Franco and Liz talk to Jake about making birthday party plans. Franco suggests camping, but Jake says that he can&apos;t go. 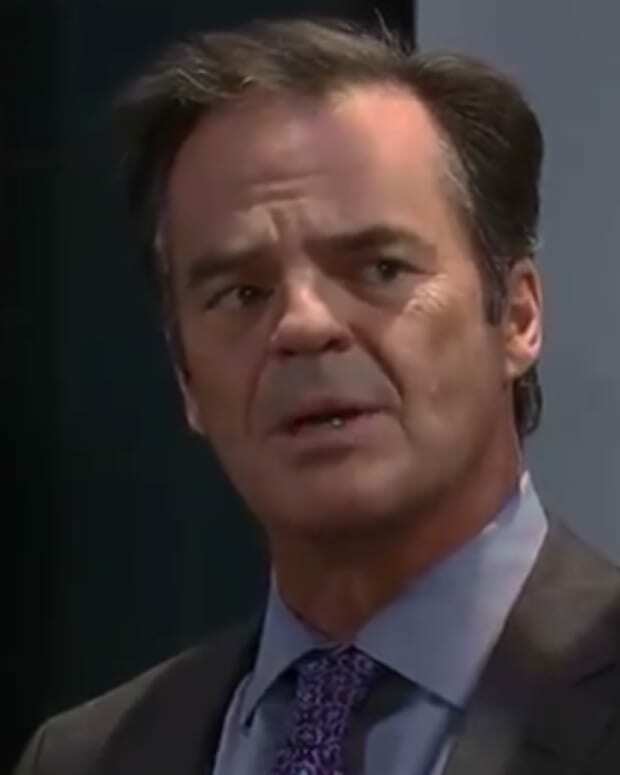 When pressed, he claims he doesn&apos;t want to leave JaSam out. Sam decides to hack into the Crichton-Clark records to see when Jason was admitted. She finds out that it was August of 2014. Jason wishes he could remember, so Sam takes out some vodka to loosen things up. The vodka spills on the book, which loosens up two pages that were stuck together. Jason recognizes the drawing on the new page as a chimera. Jake pulls out the timeline and draws a picture of a chimera.